Sidetracked, and not for the first time…! 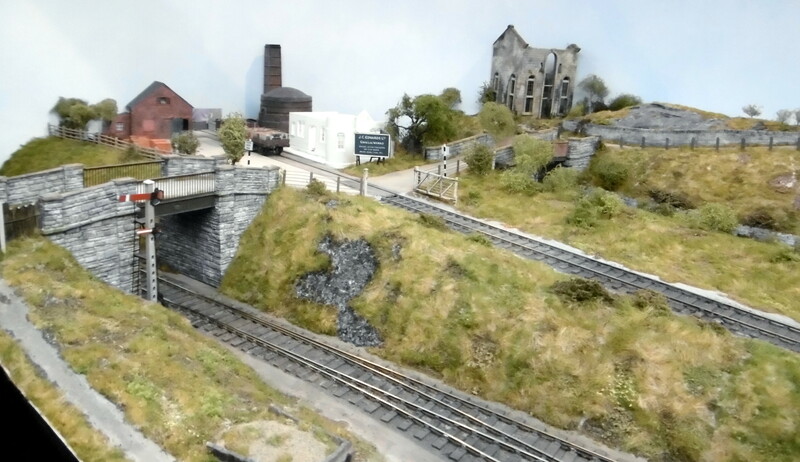 Once again I have found myself being tempted to take a fresh look at Llangunllo, and you can blame the latest issue of the Model Railway Journal for that. For one photo in particular got me thinking, say what you like about the journal, but it certainly inspires! So the shed diorama was put aside whilst I faffed around with some styrene strip, more of which later. I have however continued to work on the engine shed itself which currently looks like this…….. Interior window frames are yet to be fitted, and will be designed to hold the glazing in place. Doors are in the process of being made from card, I made a right dogs ear of the first pair but the replacements are looking okay at the moment. Roof slates are those produced by ‘York Modelmaking’. I haven’t lost interest in the diorama far from it in fact, but I felt the need to go back to Llangunllo and scratch a couple of itches. I also need to crack on and build more rolling stock, well replacements for old GWR examples to be more precise. Mind you I have been saying that for years but always end up being distracted! Another thing that I need to address is the Llanbister Road sector plate, not that its giving any problems. I just feel that a few cassettes would make life easier, especially once the extra rolling stock finally makes an appearance, for they will come in useful for storing it. I had intended to replace the sector plate last year but life, and other projects got in the way. 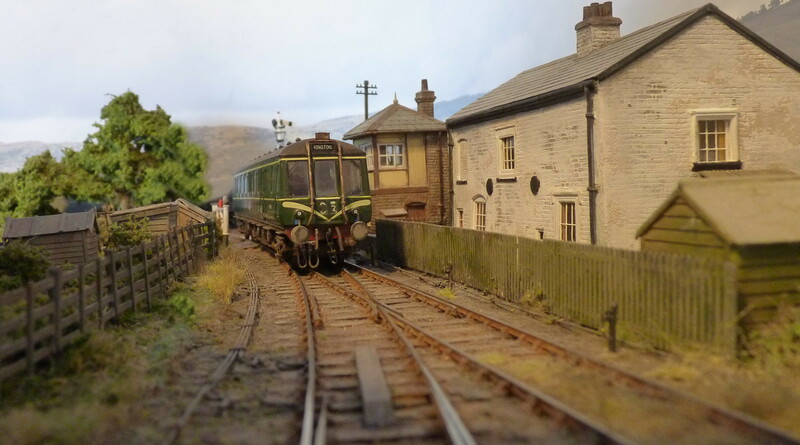 So where does MRJ and Microstrip enter the picture, well I was never really happy with the old footbridge, so when I saw the photos of Geoff Kent’s lattice version on his ‘Black Lion Crossing’ layout in MRJ No 269 temptation proved too great. For those of you who are unaware of the layout, here is a selection of photos that I took with the owners permission at Expo EM in 2017. The layout represents a number of freight only lines in the Wrexham area, the only passenger trains are those provided for workmen. Why I didn’t go down the lattice route in the first place I wouldn’t know, perhaps it was the thought of constructing the damn things? I did search for a suitable etch, and even took a look at the Hornby footbridge. Alas both would have been costly exercises given that most of the parts would have been of little use. No, the sensible option was to build my own from scratch but first I needed a drawing, cue for this interesting and essential book for the would be bridge builder……. Plans for a GWR footbridge can be found within the book, I only needed the main girder section, which was scanned and printed out on good quality paper. Taking note to calibrate my printer beforehand so the plan came out to scale, very important that and even more so with track templates. The drawing was then secured to the underside of a piece of glass with double sided tape. The top and bottom rails were then laid on top of the glass and secured with masking tape. It was then a case of building up the lattice from 0.020 x 0.040 styrene strip, surprisingly it didn’t take too long to produce each girder. Once painted a light grey the whole structure was dusted with soot, and rust weathering powders whilst the paint was still tacky. 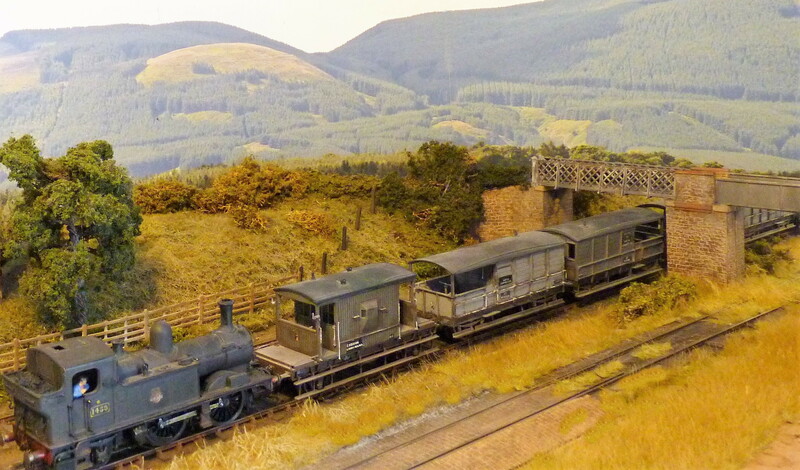 Today the scene looks like this, in the end the idea of a water tower was dropped to make the handling of stock easier in what is the fiddle yard. I did start to construct the tower on a sub base so it could be removed during operating sessions, but due to the delicate nature of the structure it would most likely have become damaged. So I have returned to the original story of watering facilities being provided at Presteign and Llanbister Road. Modelling is still taking a backseat here, and whilst there are several projects on my workbench none are ready to share with you yet. However during a recent operating session I took some new photos of Llangunllo, all of which have been uploaded into the photo gallery All the photos there can be viewed full size by clicking on them and then the ‘comment’ button, which should appear below each photo on the right hand side of your screen, a further button will then appear labelled ‘view full size’. Whenever you see a mosaic of photos anywhere on the blog you can do exactly the same. Riding the pick up goods………. The old layout has been somewhat neglected of late, and a few question marks have been hanging over its future. So earlier this week I dusted everything down, cleaned the track, had a brief operating session and ran a critical eye over the whole layout. From an operating viewpoint I was more than satisfied, 4678 was the branch engine for the day and didn’t let me down. I did have a few issues with the uncoupling magnets, which was mainly due to their markers having been disturbed. But in truth I’m drifting away from using magnets of any kind for uncoupling, and find myself using the hand in the sky more and more. This might seem to be taking a backward step, but on a layout that never leaves home and with very little shunting taking place it doesn’t bother me one jot. The hand in the sky, the uncoupling device comprises an old scalpel handle and a piece of brass wire. The curved piece of the wire rests upon the ballast, and with the remainder of the wire aligned with the coupling hooks the handle is gently tilted forward to depress the coupling hooks. So much for my current thoughts on uncoupling, which might come as a shock to some, and dismay others. Another thing that I’m not entirely happy with is the trees, I feel that I’m slowly getting there but can certainly improve. I rather like what Paul Marshall-Potter is doing in that department and am sure a little experimentation of my own won’t go amiss. On a slightly different note I have finally made a decision on the Llanbister Rd. shed water tower. In short it had to go, so I’ve been looking for another location for it and came up with the idea of using it at Llangunllo. Trains travelling to Presteign from Titley Junction faced some severe gradients, and had the line been extended to Llangunllo they would have faced even more. No watering facilities were provided at Presteign, so why not provide some at Llangunllo? I’m sure the chance to top up the tanks would have been welcomed, if not necessary after such a steep climb up the valley. I used the old Ratio GWR water tower kit as a starting point, but rather than model the conical version I cut the tank down, as I find that design to be more attractive. I also felt that with it being shorter it would sit better and blend more easily into the background. Early days, the tower is far from complete and will be built on a sub base, as the etched ladder and other fine detail is rather delicate and prone to damage. The whole base will then be blended into the surrounding ground. The mirror has been adjusted slightly to give the impression of a gradient, the line dropping away towards Presteign. It is also capturing the reflection of the road bridge, thus adding to the illusion of the line carrying on into the distance. 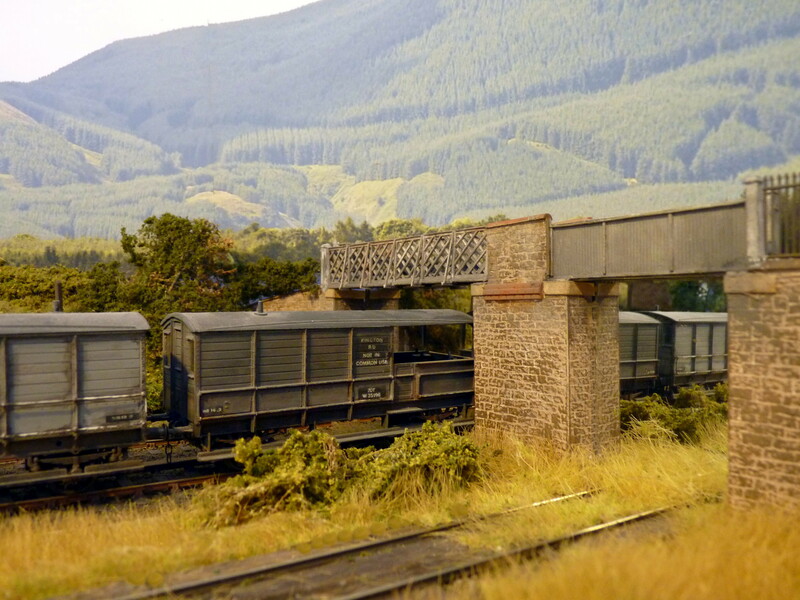 Having taken on some water 4678 draws forwards prior to shunting the yard…..
Shunting complete the pick up goods heads for Llanbister Road. Groundwork and yet more pondering…. 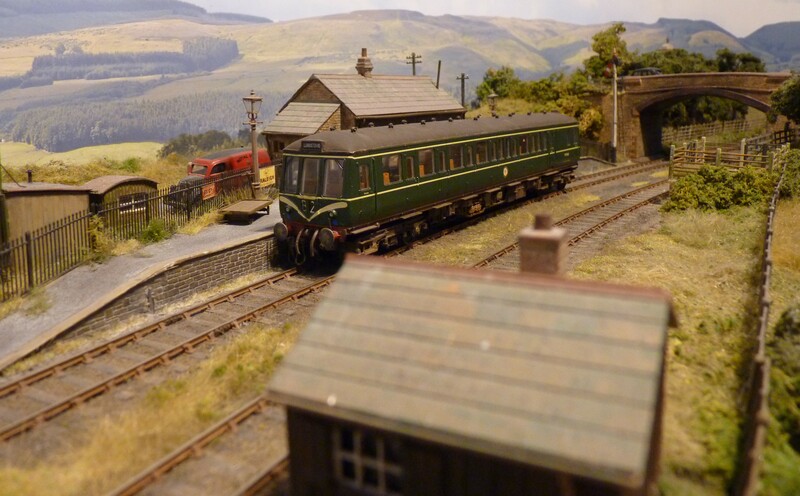 After weeks of inactivity I have at last managed to make a little progress with my Llanbister Rd. diorama. Early last week I laid the rest of the plaster bandage and left it to dry out. It has since been skimmed with a light covering of plaster and PVA to seal the surface, and now awaits painting. The track bed, sleepers and rail also need painting and prepared for ballasting. Despite the plaster, the diorama is still extremely light, and its frame has remained stable, which is a huge relief. This is how the scene looks today, a small coal stage is taking shape but a question mark still hangs over the water tower. I have dropped plans for a grounded coach body in favour of a couple of rustic huts, but don’t read too much into the one you see here. 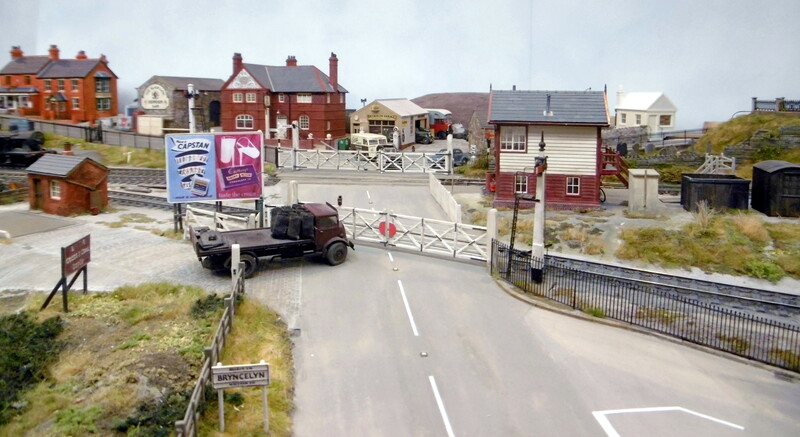 The GWR buffer stop is an old Mainly Trains (Riceworks) kit that I had in stock, and will end up being buried in long grass, weeds or whatever nature throws at it. I might yet abandon the idea of a through shed, if I do then the shed will be moved closer to the end of the siding, which might be more sensible as it would mask the end of the diorama nicely. But then again the original plan called for some trees to do that particular job. The coal stage isn’t based on any particular prototype, instead I have taken various features of the stages that appeal to me, and combined them into one. It is far from complete at the moment, the walls are ‘palight’ foamboard with Wills half round ridge tiles on top. The stonework was scribed into the foamboard surface with an empty ballpoint pen, and the corner joints filled with Squadron Green putty. In theory the putty being solvent based should have attacked the exposed foam core of the board, but it hasn’t. So as an experiment the Wills ridge tiles were cemented in place, again on exposed edges with Revell liquid poly, and also Butanone without any problems. Despite the success of these experiments I am still wary, so be warned if you decide to do the same. This is Silhouette / Mininatur meadow grass (late fall}, which I have been using for several years. First on Penhydd and then on both versions of Llangunllo, yes it is expensive but it is a quality product. Some of the material was actually salvaged from Penhydd and used on Llangunllo, something that is almost impossible to do with other ground coverings. On a different note I recently placed an order for some scenic materials with Mininatur . It is possible to buy some of their materials here in the UK, but since the demise of ‘International Models’ I have been unable to find a stockist of their late fall meadow grass. So for the past few years I have ordered it directly from the manufacturer in Germany, who provide an excellent mail order service. The postal charges (DHL) might seem a bit steep but when you consider that it is a one stop shopping experience, it is no more expensive than having to make several separate purchases from different sources over here. This is the same grass mat teased out into small clumps and mixed with a little hanging basket liner, the different materials being blended together with Mininatur static grasses. The beauty of these products is in their colouring, which to my eye is far more natural looking than cheaper alternatives. Well that brings this update to a close, what I do next and in what order remains to be seen. “The best laid schemes o’ mice an’ men”. The plan was simple, cover the card scenic foundation with plaster bandage, and allow it to dry out over Christmas. However I hadn’t factored in a viral infection, which not only put paid to any modelling, but Christmas and the New Year as well. At the moment the track work is currently protected under some polythene, and will remain so until the last of the plaster bandage has been applied over the card supports in the photo. I can’t see myself doing any modelling for a few weeks yet as our recovery is turning out to be a rather slow process. 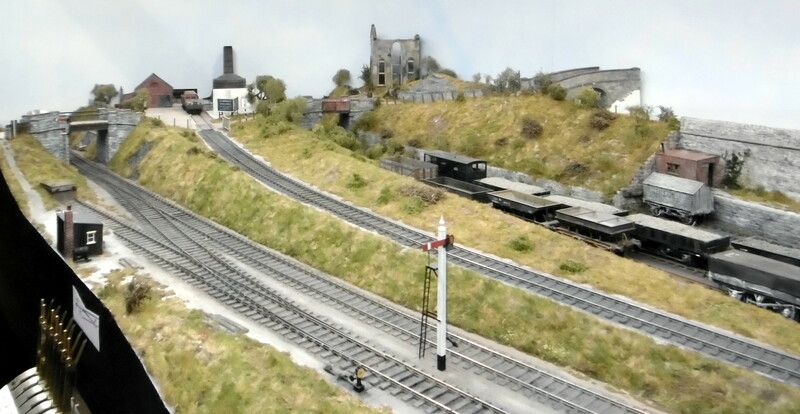 Meanwhile one of my modelling friends gave me something to ponder by saying how he could now picture the scene with its coaling stage and water tower? Well I have no plans for any watering facilities, which I suppose might seem strange. 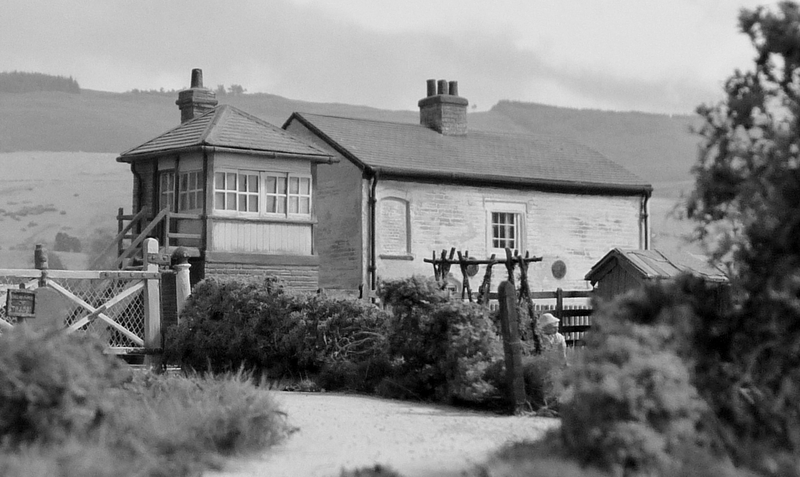 But like Kington engine shed the one at Llanbister Road will just have a pit and coaling stage, water being provided at the station, or within its goods yard. Nevertheless I am always open to ideas so started to build a small version of the Ratio water tower. No decision will be made until the plastering has been completed, and then I will juggle things around to see if the idea works without crowding the scene. One other project that I had hoped to finish by Christmas was my Class 122 ‘Bubblecar’, which I started life as a Hornby Class 121. Shortly after starting the conversion Dapol produced their model, I actually bought one but wasn’t impressed with it. So I sold it on and returned to my conversion project which has given me far more pleasure than opening a box. I still have plenty of work to do on the Class 122 yet, and no doubt a full description will appear once the unit is complete. Well that brings everything up to date, it might be a week or two before I have anything new to share, it all depends on how soon I return to modelling. I apologise to everyone who has been kind enough to post a comment, it took several attempts to approve them, and I am still unable to respond.